See Fred Run: Teaches 50+ Sight Words! Learning to read has never been more fun than it is with Ed and Fred! See Fred run, jump, and climb his way to safety in this hilarious beginning reader text. 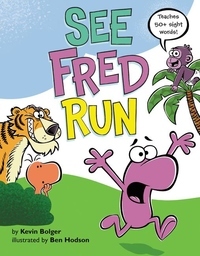 See Fred Run has been carefully crafted to teach more than 50 sight words--the simplest, most commonly used words young readers must learn to recognize "on sight," as well as more advanced words to challenge early readers. The patterned structure and humor make this a perfect introduction for beginners or a fun refresher for older readers. Fans of See Fred Run can also brush up on sight words with Fun With Ed and Fred, short vowels with Gran on a Fan, and long vowels with companion book Lazy Bear, Crazy Bear. As Kirkus Reviews said of Gran on a Fan "New readers... will hardly be aware that they are supposed to be learning basic phonics because they will be giggling."